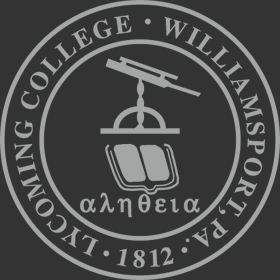 Top: Jessica Tayson created the logo used for communications about Lycoming College’s Haberberger Fellowships. Bottom: Lin Nazzaro created a logo to be used by the SPCA for its 125 anniversary. A knack for capturing the essence of a program in a visually appealing graphic earned two Lycoming College students the honor of having their logos selected for use in upcoming promotions. Jessica Tayson, a senior commercial design major and corporate communication minor from Delta, Pa., won a contest for creating a logo for one of the College’s new programs. Lin Nazzaro, a senior commercial design and painting major from Dover, N.J., created a logo to be used for the Lycoming County SPCA's 125th anniversary. Tayson created a brand image to represent the College’s Haberberger Fellowships, which are annual scholarships given to juniors to complete a scholarly paper during their senior year. Her logo was selected from designs submitted by students in the College’s Special Projects in Commercial Design course. Nazzaro’s design was selected from submissions from students and professionals around the state. Her logo will be used by the SPCA for print and online media, and on T-shirts and other merchandise throughout 2017.